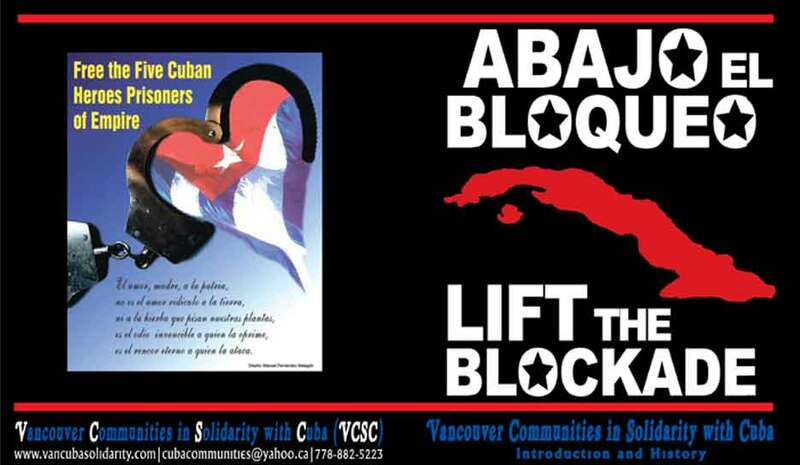 Vancouver Communities in Solidarity with Cuba (VCSC) - MATERIALS! MEMOIR OF A TRIP WITH ADVENTURE, EDUCATION AND POLITICS! How I Learned to Love Cuba! 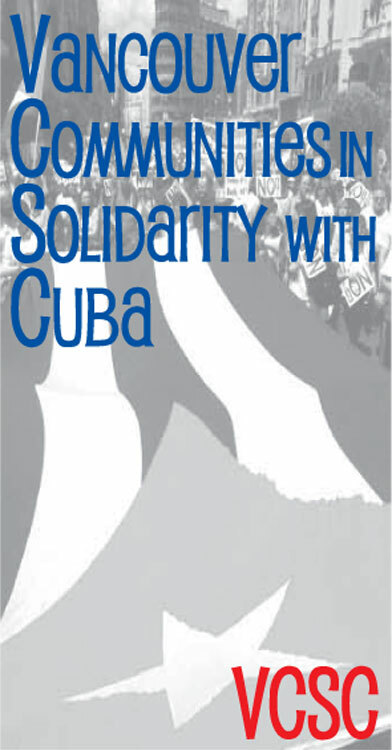 Reprint Policy: Reprinting of all or part of this booklet, in print or online, by progressive media is welcomed, with source credit to the author and Vancouver Communities in Solidarity with Cuba (VCSC). All other media or institutions must request permission. click here to view VCSC brochure! Luis Posada Carriles is an admitted anti-Cuba terrorist. As a former CIA operative, he received training from the US Army at Fort Benning, Georgia in 1963. His long terrorist résumé includes a conviction for attempting to assassinate Cuban President Fidel Castro in Panama using explosives, and, by his own admission, a string of bombings at tourist spots in Cuba in 1997, which killed an Italian tourist and wounded 11 other people. Additionally, recently declassified CIA and FBI documents reveal that he was heavily involved in planning the bombing of a Cubana Airlines passenger flight in 1976 that killed all 73 passengers on board. These are just a few items on a very long list of attacks Carriles has organized or carried out. Posada came to the U.S. sometime in late March or early April 2005, and is seeking asylum. He is only one terrorist in a whole line of anti-Cuba terrorists that have been backed by the U.S. government. The hypocrisy of the U.S. government’s “war on terrorism” and “anti-terrorist” policies are clearly exposed as lies by their support of Posada. The Cuban Five (five Cubans who came to the U.S. to gather information about anti-Cuba terrorist groups operating freely in the U.S. to prevent terrorist attacks on Cuba) were imprisoned by the U.S. administration with sentences ranging from 15 years to double life. Yet, a genuine terrorist like Posada walks freely in the U.S.. Venezuela has formally filed an extradition request for Posada (Posada escaped from a prison in Venezuela while awaiting trial for bombing the Cubana Airlines flight), and Cuba has also requested that he be extradited to Venezuela. We, the undersigned demand that this confessed and convicted terrorist must not be granted asylum by the U.S. government and must be extradited to Venezuela. LIFT THE BLOCKADE ON CUBA! We call on you to cease the unacceptable blockade of Cuba immediately. Imposed since 1962, the U.S. blockade has been reinforced in October 1992 by the Cuban Democracy Act (or "Torricelli Law"), which aimed to restrain the development of the Cuban economy by: i) the strict limitations of the transfers of foreign currencies by the families in exile, ii) the six month ban to enter U.S. harbours of all ships that had anchored in a Cuban port or carrying Cuban-made products, iii) sanctions against firms doing commerce with the island even though under the jurisdiction of a third state. The blockade was systematized by the Cuban Liberty and Democracy Solidarity Act ("Helms-Burton Law") of March 1996, aimed to harden the "international" sanctions against Cuba. The U.S. blockade against Cuba has been officially condemned for 12 years by an overwhelming majority of nation-state members of the United Nations General Assembly. The blockade directly subjects the people to the maximum of suffering and infringes upon the physical and moral integrity of the whole population. In this respect, they can be seen as a crime against humanity. We call on you to release the five Cubans: Gerardo Hernández Nordelo, Ramon Labañino Salazar, Fernando González Llort, René Gonzalez Sehwerert, and Antonio Guerrero Rodriguez, who have been unjustly imprisoned in the U.S. for defending the Cuban people against terrorist attacks. We urge you to publicly intervene with the U.S. government and demand the release of release the five Cubans: Gerardo Hernández Nordelo, Ramon Labañino Salazar, Fernando González Llort, René Gonzalez Sehwerert, and Antonio Guerrero Rodriguez, who have been unjustly imprisoned in the U.S. for defendingthe Cuban people against terrorist attacks.